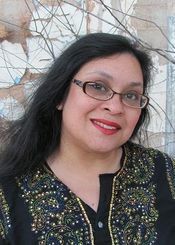 Mina Khan is a Texas–based writer and food enthusiast. She grew up in Bangladesh on stories of djinns (pronounced ""gins""), ghosts and monsters. These childhood fancies now color her fiction. She daydreams of hunky paranormal heroes, magic, mayhem and mischief and writes them down as tales of romance and adventure. Fifty percent of the proceeds from her second novella, A Tale of Two Djinns, is donated to UNICEF for education. Two Djinns is a Romeo & Juliet tale with genies, feminists and a happy ending.